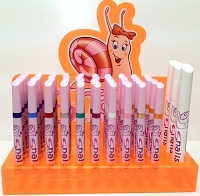 New Snails Markers are just as colourful and safe as the kids’ nail polishes – but they’re pens! So now you can have fun drawing whatever you want on your nails. Faces, hearts, kitties, whatever – it’s totally up to you. And with 10 beautiful colours to choose from.